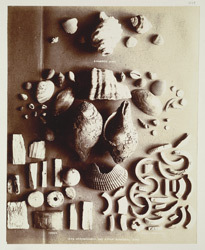 Photograph of miscellaneous shells, shell bangles and ivory from excavations at Brahmanabad and Depar Gangro in the Hyderabad District of Sind in Pakistan, taken by Henry Cousens in 1896-7. Cousens wrote in Brahmanabad-Mansura in Sind Archaeological Survey of India, Annual Report 1903-04, "Both here and at Depar Gangro we found abundance of shells of sorts. They are scattered about, some of them very tiny; and in some places large areas are quite white from the quantities crushed and pulverised on the surface. From some of the excavations I got several old hindu conch shells, some quite decayed, and great quantities of fragments of shell bangles made from these, the shell being cut across in sections and joined together with wire...Such bangles are still worn, especially by the Brinjara tribe, the arms of whose women are covered with them from wrist to elbow. In many cases patterns were incised upon them; and, as they have somewhat the appearance of ivory, Mr Bellasis mistook them for such. I have several large fragments of these shells, some completely cut away down to the spiral core. Ivory I did find in lumps in a room, which must have been that of an ivory turner, since the pieces are partly turned; but the ivory is more or less disintegrated, whereas the shell seems to have suffered no harm whatever from long years of exposure or burial."